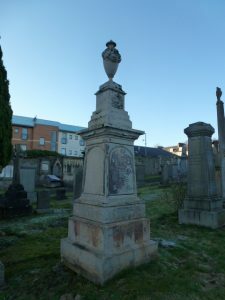 David Scott was a member of a prominent manufacturing family. A skinner and wool merchant to trade, he established his business in the Dudhope area of the town. He traded for nearly thirty years before his relatively early death. David Scott began his working life as a clerk in Edinburgh. In 1843, a young man in his early 20s, he established his business as a skinner/tanner at Baldovan where he tenanted a Tan Yard and Cottage. An advertisement of 19 May 1848 indicated that David Scott 'will be removed to his New Work, Dudhope.' The location of this 'New Work' was on the west side of Park Street at the junction with Lochee Road, opposite the west gate of the Dundee Barracks (now Dudhope Park). From there, he continued and expanded his business into a thriving Tanworks and Wool Merchants. David Scott was born the eldest child of David Scott and Grizel/Grace Morrison. At the time of his birth (1820), David Snr was listed as a ‘weaver,’ having bought a warping mill in 1797. He, over time, merited the listing as ‘manufacturer,’ based at Mid Wynd, Perth Road. The Mid Wynd Works were to become an extensive operation, for weaving and finishing (linen and jute), with tall blocks on a steeply sloping site, running from Hawkhill, south towards Perth Road. Although five of David’s brothers were to become prominent within the manufacturing business, he himself remained the only one to be involved in the tanning/wool trade. Doubtless, the new siting at Dudhope would have been thought to be advantageous for all concerned. David Scott’s commitment to the location was swiftly followed by the building of a residence for himself (circa 1855) at 114 Lochee Road, immediately round the corner from the works. 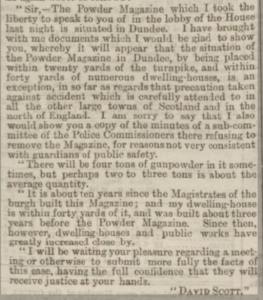 However, there remained a concern for him in the siting of Dundee’s Powder Magazine which was located to the south west of the Barracks but a mere 40 or so yards from David Scott’s properties. 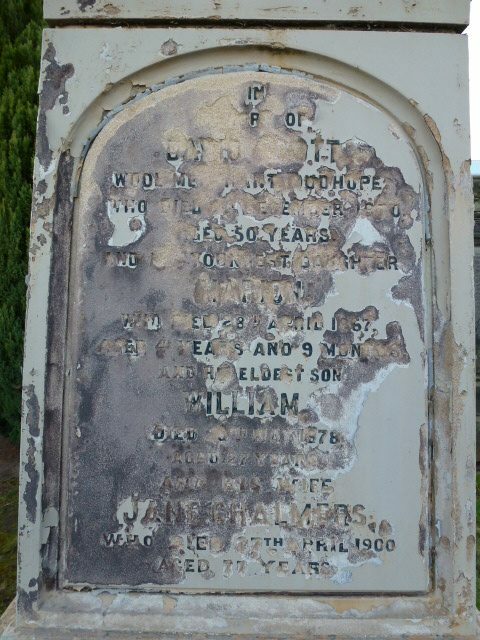 It had been erected there circa 1858. His concern was further compounded by an attempted break-in to the Powder Magazine, causing great disquiet to the increasing number of residences and businesses in close proximity. David Scott was a vocal complainant. 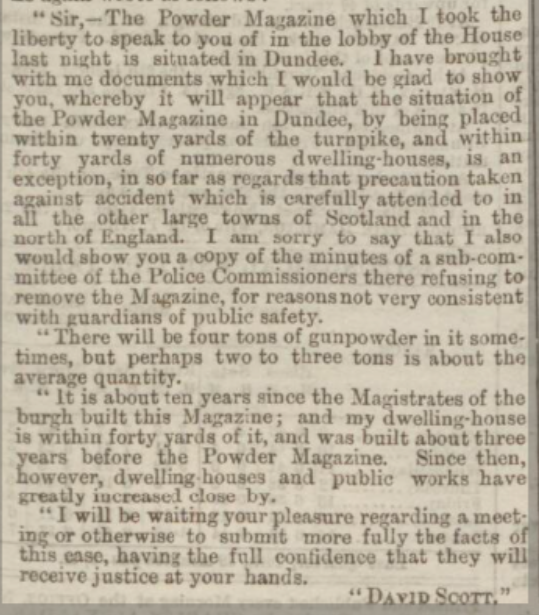 The town’s response was to place the onus on Scott to determine how other towns dealt with their magazines. None had a magazine so precariously placed as Dundee’s. His campaign to remedy the difficulty saw him communicate with the Town Clerks of Glasgow, Edinburgh, Aberdeen, Hull and Liverpool. He also summoned the support of the Home Secretary and even the Lord Advocate. The debacle continued for some considerable time and finally resulted in in a minor victory, with the erection of a higher wall being constructed around the magazine. 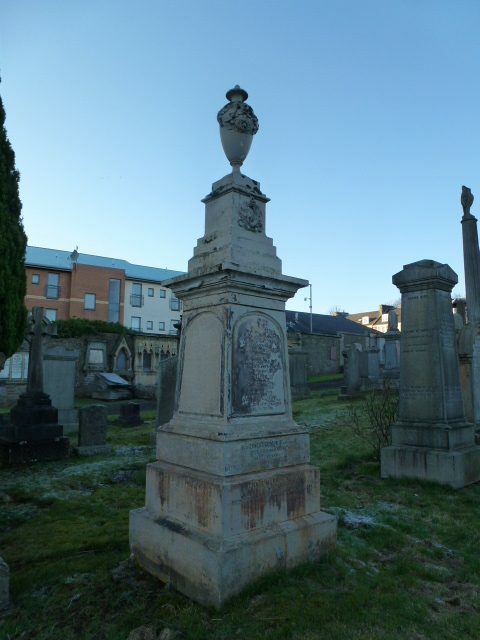 David Scott’s death occurred in 1870 at a relatively moderate 50 years of age. He had built up a business as a wool trader over 27 years. His established firm was continued by his eldest son, William Chalmers Scott, trading as ‘William C Scott – Tanners & Wool Merchants.’ Unfortunately, William survived his father by mere 8 years, after which their concern was continued by his younger brothers, George Chalmers Scott and James Scott, while maintaining the same title. Old Parish Registers. Dundee. Births. (1820). 282/ Scotlandspeople website. Old Parish Registers. Liff, Benvie & Invergowrie. Marriages. (1850). 301/ 40 332. Scotlandspeople website. Dundee Postal Directory, 1846-47. p.160. Dundee Central Library, Local Studies. Dundee, Perth & Cupar Advertiser. 19 May 1848. p.4. Findmypast website. Dundee Postal Directory, 1869-70. p.205. Dundee Central Library, Local Studies. Dundee Postal Directory, 1850. p.153. Dundee Central Library, Local Studies. Statutory Registers. Dundee. Deaths. (1870). 282/1 473. Scotlandspeople website. 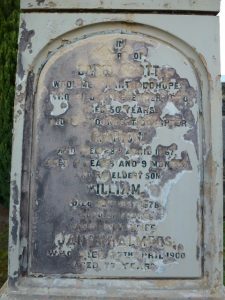 Memorial Stone. Western Cemetery. Perth Road. Dundee. Compartment 3. Dundee Street Directory, 1856-57, p.272, Local History Department, Dundee Central Library. Legal Records. Wills & Testaments. Dundee Sheriff Court. (1849). SC45/ 31/ 9. Scotlandspeople website. Dundee Courier. 24 January 1935. p.5 Findmypast website. Watson, Mark. Jute and Flax Mills in Dundee. (1990). Tayport. Hutton Press. p.218. Dundee Courier. 9 March 1868. p.3. Findmypast website. The information above about David Scott has been collated from a range of digital and hard copy sources. To the best of our knowledge it is correct but if you are relying on any information from our website for the purpose of your own research we would advise you to follow up the sources to your own satisfaction. If you are aware of an inaccuracy in our text please do not hesitate to notify us through our Contact page.